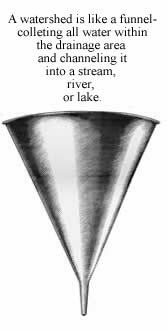 A watershed is the land area that drains water to a particular stream, river, or lake. It is a land feature that can be identified by tracing a line along the highest elevations between two areas on a map, often a ridge. 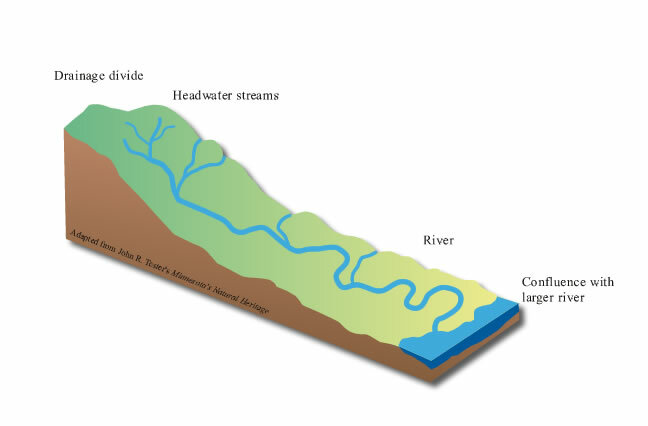 The diagram below suggests a typical watershed that starts with small headwater streams in the higher elevations of the drainage basin. Water flows downhill from the drainage divide into larger streams, eventually joining a river. As more tributary streams join the river, the volume of water increases. This river eventually flows downstream into an even larger river at the confluence. National Geographic's interactive river system. RiverSmart: What is a Watershed?